Photo provided by one of our Facebook mamas! Thanks! 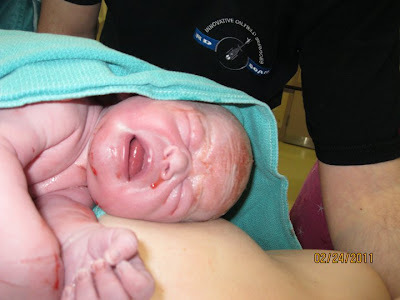 Another great hospital birth. Not only a healing second baby but a great description of what happens mentally during transition and how important good support is. I love too how this story illustrates how it can be quite helpful to arrive later rather than earlier to the hospital. Enjoy! On September 13, 2010, three days before my estimated due date, around 3:30pm or so, I started having contractions that were between 5 and 15 minutes apart. They weren't really uncomfortable or anything...I could talk through them and be pretty active for the most part. I had spent the majority of the afternoon cleaning, so I just figured that my cleaning spree had started the contractions. I figured that they would fizzle out after a couple hours. Things went on normally for the next couple hours. We made dinner and ate, put Reilly to bed, I took a shower, and we got into bed. I was trying to time my contractions, but they were still erratic...lasting anywhere from 30-45 seconds and coming every 2-5 minutes or so. Around 12:15 am, my contractions got intense enough that I had to concentrate on them, and I decided that we should probably start getting ready to head to Justin's house to drop Reilly off to stay the night. I didn't see any need to rush, but we couldn't really diddle around for very long since we had quite the drive. We got Reilly up and loaded into the car. My contractions by this point were still pretty erratic. I wasn't at all worried, I just wanted to make sure we got to the hospital in time. We dropped Reilly off at Justin's house around 1am or so and promptly drove to Tripler (Army Medical Center). By the time we got to Tripler and up to Labor and Delivery, it was almost 1:30am. We had to stop multiple times on the way up to the L&D floor because I was having contractions. Thankfully there was no one in the hospital walking around since it was so early in the morning. I got there and they got me into triage so that I could get checked and see what I was at. I told the OB how far apart my contractions were and everything. She didn't really seem to think that I was in labor, and she probably assumed she would send me home. I got into triage, only to find out that I was dilated to 5cm. It seemed like I was doing a lot more work. They monitored my contractions, and like I had been feeling, they were pretty erratic. The OB (the midwives didn't arrive to L&D until 6am) said that I had a couple options...I could be admitted or I could go walk around for a little bit. I didn't think I could go for a little stroll, but I didn't want to get admitted because that would mean I would have to be put on constant fetal monitoring, which I didn't want. The nurse said I could stay there for a little bit and think it over, so I stayed in triage to think it over. By this point I was having a really hard time coping with the pain, and told Brad that I wanted an epidural and pitocin because I just wanted to get this done and over with. I was so tired and the contractions hurt so bad that I couldn't get a handle on them. Everything that I could try to use for coping wasn't working. I was getting really frustrated with myself and the pain and all I wanted to do was stop it. Right around the time I made this decision, my water broke (officially at 2:40am). The nurse came back in to verify that my water had broken and that there was no meconium in there. The OB came back in to check and see how far I was dilated. No meconium in my water (yay!) and in the hour or so since I had initially been checked, I went from 5 cm to 8 cm. I told the OB that I had decided that I wanted to get pain meds. She brought in paper work for me to sign. I kept having contractions that seemed to be getting closer together by the second. They brought me a wheelchair to get me to a delivery room, but the contractions got so bad and suddenly, I felt this really intense urge to push. I told the nurse that I felt like I had to push. She told me not to push (yea alright...) and she quickly checked me and after that it was such a blur. I was still in triage, and there were people rushing in left and right with birthing utensils . I didn't have the chance to get an IV (I didn't want one per my birth plan) and they barely had a chance to get the fetal monitor on my stomach. I started pushing with my instincts for the most part. They coached for a few of them but for the most part, I pushed all by myself. When she started crowning, they notice that she had meconium in her hair, so I had to give super big pushes at the end so they could get her out fast. I don't remember the crowning causing pain, or the tell-tale ring of fire. My contractions hurt more than any pushing I was doing. They tried to get me to lower the bed, but I wanted it so I was sitting up, not laying down. I was half laying down when I started pushing and it was too painful. (In hindsight, I should have gotten up and moved around during the end of my labor and the pushing stage, but I wasn't concentrating.) I am so thankful that my daughter had other plans when it came to coming out. If it had taken any longer, I would have gotten the same, exhausting, drug induced experience that I had with my first daughter, and I am so glad it turned out differently. I will never have anything other than a natural, drug and intervention free birth again (unless absolutely necessary). Ophelia was born at 2:54am on September 14, 2010. They put her directly on my chest, and cleaned her up from there. I had two small labial tears, neither required stitches. After they cleaned all of us up, they moved us all from triage to an actual labor and delivery room so they could take her vitals and I could get cleaned up more before they transferred me to the mother/baby ward. She weighed 7lbs 15.8oz and was 20" long, with a head full of red hair and blue eyes. This birth was completely different that my first. With my oldest daughter, I was young, and went into my pregnancy with the notion that "I'll try natural childbirth, but if it gets to be too much, I'll just get the drugs. ", which is exactly what I did. I got an epidural at 6cm and it took me almost three hours to push her out. I even ended with an episiotomy (at my midwives suggestion. She did say it was necessary as my daughter was stuck on a bone and wasn't turning her head the way she was supposed to.) I was dead set on making this birth a more positive experience and the only thing I regret was saying anything to the nursing staff and OB about drugs. The look on their faces when I said "epidural" was one of pure joy and "I knew she'd cave." I also know that they weren't happy with the sounds I was making. Obviously I was in a lot of pain and I needed to voice it. I'm sure someone said something about scaring other women, but I wasn't paying full attention. You can read this mamas blog here.